Collaborative content creation inevitably reaches situations where different points of view lead to conflict. One of the most prominent examples of collaboration online is Wikipedia, the free encyclopedia that anyone can edit. It is a system where conflict is mediated by both policy and software, and where conflicts often reflect larger societal debates. We are building a platform for the real-time analysis and visualization of such controversies in Wikipedia. Controversy metrics are extracted from the real time activity streams generated by edits to, and discussions about, individual articles and groups of related articles. An article’s revision history and its corresponding discussion pages constitute two parallel streams of user interactions that, taken together, fully describe the process of the collaborative creation of an article. Our platform, Contropedia, builds on state of the art techniques and extends current metrics for the analysis of both edit and discussion activity. Furthermore, the combination of these two approaches allows for a deeper understanding of the substance, composition, actor alignment, trajectory and liveliness of controversies on Wikipedia. The platform is designed with a special focus on the utility of the metrics and the public relevance of the visualizations: the metrics focus on the extraction of societal controversies while the visualizations aid in shaping new knowledge about the controversial topic. Our research aims to provide a better understanding of socio-technical phenomena that take place on the Internet and to equip citizens with tools to fully deploy the complexity of controversies. Contropedia will be useful for the general public as well as user groups with specific interests such as Wikipedians, scientists, decision makers and media communicators. This research was made possible by EU FP7 EINS grant #288021 and in part by EU FP7 EMAPS grant #288964. Have a look at our instruction video or the case studies. What do the colored links convey? How is the controversy score calculated? Currently the controversy score is based on wiki links found in substantive disagreeing edits. Have a look at our CHI'15 paper for more detail. Why can't I see a minified article in the layer view? Probably your browser or screen are too small. Maximize your browser, or zoom out (e.g. ctrl -), to avoid the problem. Why does Contropedia look weird in browser X? Contropedia is optimized for Google Chrome. Which languages does Contropedia support? Currently only articles from the English language Wikipedia can be analyzed. We are working on extending Contropedia to analyze other languages too. How to use Contropedia on an article which is not currently listed? For now you can send an email to contropedia [thingie] digitalmethods.net and we'll add the article ASAP. How can I cite Contropedia? Does Contropedia work on other languages besides English? Yes, but only the edit metric is currently implemented. For now discussions are not parsed for other languages. Where can I watch more videos about Contropedia? Can I freely use the images on this site? Yes, they are licensed as CC BY-SA 4.0. Why is my question not answered? Although Contropedia currently has a limited set of features, various researchers started to use and test the platform. We collected and described the ones we are aware of. Below, one can find a brief description of them. Project description: Case study on the article about Global warming. Researchers: F. Flöck, D.Laniado, F. Stadthaus, and M. Acosta. Project description: exploration of how WikiWho, WikiColor and Contropedia could be beneficial to each other. Researchers: Hannah Ackermans (rMA student, Comparative Literary Studies, Utrecht University, the Netherlands) and Ann Rigney (professor of Comparative Literature at Utrecht University and co-director of the University research focus area Cultures & Identities). Abstract: By first analyzing the edit history of the English Wikipedia page of "Bloody Sunday (1972)" and then comparing the English Wikipedia page to pages in other languages, this article proposes to consider the Wikipedia page "Bloody Sunday (1972)" from the perspective of cultural memory studies, as a medium of cultural remembrance. The program Contropedia is used as an aid to visually present the editing history of "Bloody Sunday (1972)" which enables one to analyze which elements are controversial regarding this event. Subsequently, these elements are analyzed in Wikipedia pages about Bloody Sunday in other languages. In addition, the formal elements of the Bloody Sunday Wikipedia page (sources and categories) are also compared. It is concluded that Wikipedia, in its multiple linguistic manifestations, exemplifies the principle of travelling memory (Erll) and the principle of multidirectionality (Rothberg), but that it also complicates received views of such memory dynamics; more empirical research is needed to develop further tools for analyzing Wikipedia as a medium of cultural memory. Project description: manually labeling substantive discussions in discussion threads. The goal was to find out what it is more important to read to get a sense of what really happened in the story of the article, to understand why the article is in that way why something is controversial etc. Basically, which threads you would recommend somebody to read, if they want to understand the most important discussions and moments in the story of the article. Project description: design an instrument/visualization that permits to compare controversial points of two (or more) linguistic versions of the same article. This instrument allows one to see if there are significant differences between controversies in articles and if different cultures discuss about the same items or not. Various other MA students and PhD students are working with Contropedia to investigate a variety of topics. Currently more than 100 controversial Wikipedia articles have been made available in the Contropedia system. The outcomes of these researches will be made available publicly on the Contropedia website. C. Pentzold, E. Weltevrede, M. Mauri, D. Laniado, A. Kaltenbrunner, and E. Borra. (2017). “Digging Wikipedia. The online encyclopedia as digital cultural heritage gateway and site,” Journal of Computation and Cultural Heritage, 10(1), 5:1–5:19. E. Weltevrede, and E. Borra. (2016). “Platform affordances and data practices: The value of dispute on Wikipedia,” Big data and Society, 3(1). E. Borra, E. Weltevrede, P. Ciuccarelli, A. Kaltenbrunner, D. Laniado, G. Magni, M. Mauri, R. Rogers, and T. Venturini. (2015) Societal Controversies in Wikipedia Articles, Proceedings of the 33rd Annual ACM Conference on Human Factors in Computing Systems, 193-196. E. Borra, D. Laniado, E. Weltevrede, M. Mauri, G. Magni, T. Venturini, P. Ciuccarelli, R. Rogers, and A. Kaltenbrunner. (2015) A Platform for Visually Exploring the Development of Wikipedia Articles, ICWSM '15 - Proceedings of the 9th International AAAI Conference on Web and Social Media. F. Flöck, D.Laniado, F. Stadthaus, and M. Acosta. (2015). Towards Better Visual Tools for Exploring Wikipedia Article Development – The Use Case of “Gamergate Controversy”, ICWSM '15 workshop Wikipedia, a Social Pedia: Research Challenges and Opportunities. Contropedia, and the question of not analytically separating the medium and the message, Reading Wikipedia, Amsterdam, 23 November, 2015. Societal debates in Wikipedia articles, CHI 2015, Seoul, South Korea, 20 April 2015. Studying Societal Debates through Wikipedia, GESIS Computational Social Science Seminar, Cologne, Germany, 10 March 2015. Wikipedia and the Value of Dispute, Wikipedia as a Research Tool, Dutch Royal Academy of Sciences, Amsterdam, 15 January 2015. 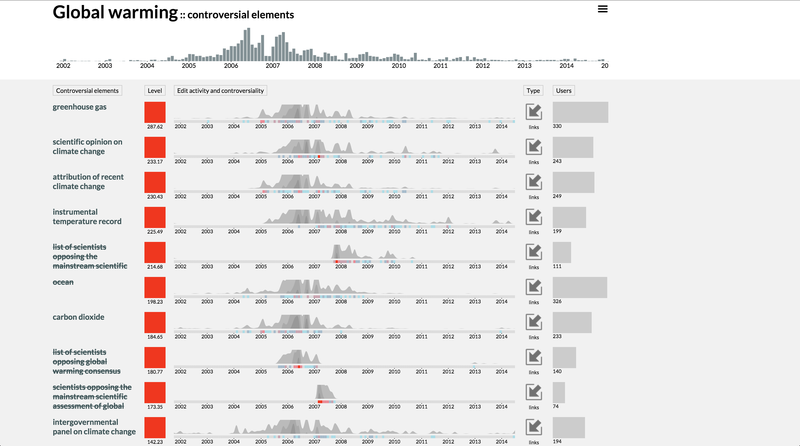 Contropedia – The Analysis and Visualization of Controversies in Wikipedia Articles, Wikisym'14, Berlin, Germany, 27 August 2014. Presentation of the first Contropedia demo, Wikimania'14, London, UK, 6 August 2014. Contropedia Talk :: Metrics of controversiality of discussion threads for the Contropedia project. Barcelona Media is a non-profit research centre. In 2012 BM had a turnover of 8,4 million € and an international staff of 100 people. BM will be involved both in managerial and technical tasks. BM is currently involved in 12 EU funded research projects, of which it coordinates 4 FP7 projects. The technical tasks will be developed by the Social Media research line. The group's work focuses on multidisciplinary research into the characterization, modelling and prediction of structural and temporal interaction patterns in social media. Current research includes analysis and modelling of online conversations and processes of online deliberation. The Social Media group is participating in the European collaborative project EMAPS, aimed at creating a platform for online controversy mapping. Dr. Andreas Kaltenbrunner is senior researcher in the Social Media Group in BM and performs empirical research on the characterization and modelling of social networks and social media. He has authored more than 30 publications in that area. Dr. Kaltenbrunner obtained his Ph.D. from the University Pompeu Fabra in Computer Science and Digital Communication in 2008, and obtained a master degree in Mathematics and Informatics from the Vienna University of Technology in 2000. Dr. David Laniado is researcher in the Social Media Group, working on quantitative approaches to analyse patterns of online conversation, with a special focus on peer-production communities and on Wikipedia. He obtained his Ph.D. in Information Engineering from Politecnico di Milano in 2012. The DensityDesign Lab is a research lab and an experimental teaching program in the design department (INDACO) of the Politecnico di Milano (POLIMI). Established in 2004, it focuses on the visual representation of complex social, organizational and urban phenomena, combining a continuous research for data visualization with information aesthetics and knowledge presentation. By rearranging numeric data, reinterpreting qualitative information, locating information geographically, and building visual taxonomies, it develops diagrammatic visualizations to describe and unveil the hidden connections of complex systems. DensityDesign carries on research projects in the domain of visual presentation, stemming from a design perspective. Prof. Paolo Ciuccarelli is an Associate Professor at POLIMI. Since 2000 he’s the Faculty of Design representative in the educational program “Master in European Design” (MEDes”). Head of the Communication Design Research Group within the Design Department at Politecnico di Milano, his research and publishing activities focus on the development of data, information and knowledge visualization tools and methods to support decision making processes in complex systems and to foster information and knowledge sharing dynamics in creative processes. In 2002 he founded POLIteca, the Design Knowledge Centre of Politecnico di Milano, where he holds the position of scientific coordinator. In 2004 he started the DensityDesign teaching program: the premise for the foundation of the DensityDesign Research Lab (www.densitydesign.org), where he’s now scientific director. Michele Mauri is a PhD candidate, specialized in data visualization. He's teaching assistant in the DensityDesign Course at Politecnico di Milano, and participant in the EMAPS project. His works won several prizes, between these Malofiej silver award in 2012 and 2013 and Information is Beautiful gold award in 2012. The Digital Methods Initiative (DMI) is the New Media research program, Media Studies, University of Amsterdam (UvA), headed by Prof. Dr. Richard Rogers. The forerunner of the program pioneered issue mapping with its most well-known piece of software, the Issue Crawler, funded by the Soros Foundation. Through support from the Ford Foundation, MacArthur Foundation, Open Society Institute, Mondriaan Foundation, Hivos, the Dutch Ministries of Foreign Affairs and Education, Culture and Science, the European Commission and some 75 universities worldwide, Rogers and his team have built over 30 info-political tools that map and cloud debates and social issues on the web. More substantively, the Digital Methods Initiative reworks method for the web, concentrating on the new research opportunities afforded treating the web as a data set as opposed to a cyberspace or virtual world. DMI seeks to learn from the methods employed by search engines, social media and online platforms generally, and repurpose them for social and cultural research. DMI is online at http://www.digitalmethods.net. Prof. Dr. Richard Rogers holds the Chair in New Media & Digital Culture at the University of Amsterdam. He is director of the Govcom.org Foundation, creator of the Issue Crawler, and director of the Digital Methods Initiative. Among other works, Rogers is author of Information Politics on the Web (MIT Press, 2004) and Digital Methods (MIT Press, 2013). Erik Borra is PhD candidate, lead scientific programmer of the Digital Methods Initiative since 2007, and participant in the EMAPS project. Esther Weltevrede is PhD candidate and lecturer at the New Media and Digital Culture program, UvA. Esther coordinates the Digital Methods Initiative and is a member of Govcom.org. Sciences Po is a fully-fledged, self-governing research university specialised in the social-economic sciences and the humanities which enrols some 9,600 students per year. Sciences Po is the leading research university in the social sciences in France with 50 full-time professors, 190 researchers, 80 foreign professors invited each year. Established in 2009 thanks to the support of the île-de-France region, the médialab of Sciences Po is a laboratory of digital resources centered on all the new technologies of information and communication. The médialab has been created to explore how data and resources provided by information and communications technologies can be harnessed for the benefit of social sciences. Tommaso Venturini coordinates the courses of controversies mapping at Sciences Po Paris and the research activities of the médialab. He lead three project on controversy mapping: EMAPS (emapsproject.com), MEDEA (projetmedea.hypotheses.org) and FORCCAST (forccast.hypotheses.org) and is a recognize expert on the topic. As a professional, Tommaso Venturini funded and leaded an innovative web-agency (www.ideaedi.it) taking part in several vanguard web projects and being responsible for numerous virtual communities. Figure 1: Controversial issues in the article on global warming. Controversiality has been calculated on the full edit history until 16 April 2014. The images are converted to grayscale. Available as an interactive visualisation here. Figure 3. 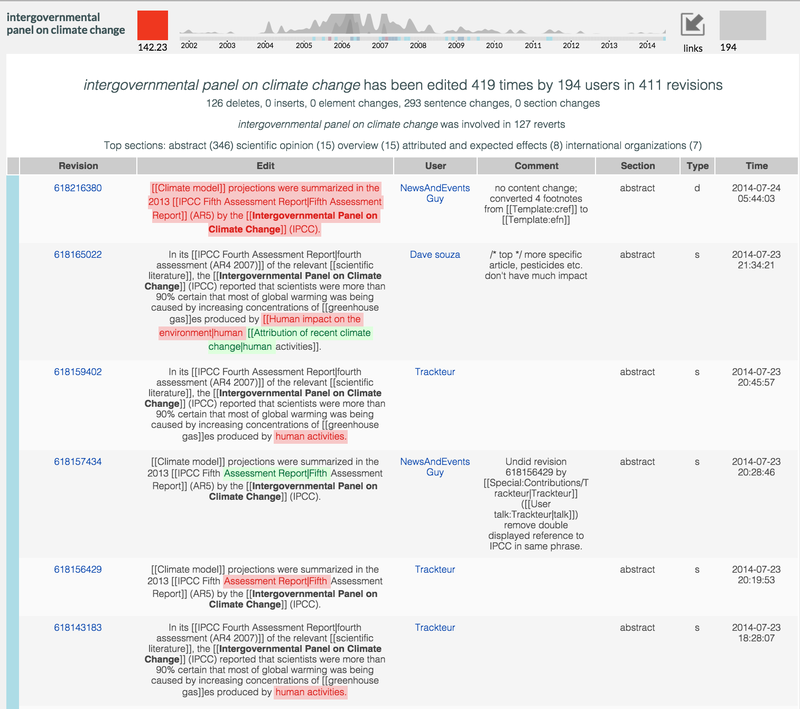 Detail of the dashboard view ‘intergovernmental panel on climate change’ in the article on Global Warming, including a partial edit history of the wiki link. The red color under the ‘edit’ section indicates a deletion of text and green an insertion of text. Controversiality has been calculated on the full edit history until 16 April 2014. Figure 4. 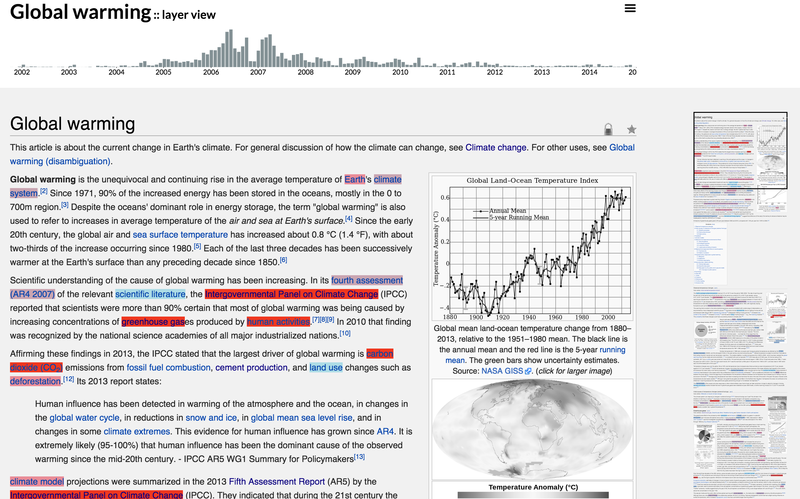 Dashboard view of the controversial wiki links in the article on global warming between 16 April 2010 and 16 April 2014. Available as an interactive visualisation here.